Place a cushion under the back of the bridge, between the bridge and the guitar body. Loosen the strings and remove the trim springs from the back of the guitar. Then carefully lift out the bridge and set it aside. Remove the pickguard screws and life off the pickguard assembly. Remove the following wires: the black ground wires soldered to the back of the volume pot, the blue and purple wires from the midboost pot, the white wire from the center lug of the volume pot, the white wire from the center lugs of the push button switch. The white wire from the center lug of the midboost pot needs to be disconnected from the lower lug of the switch. 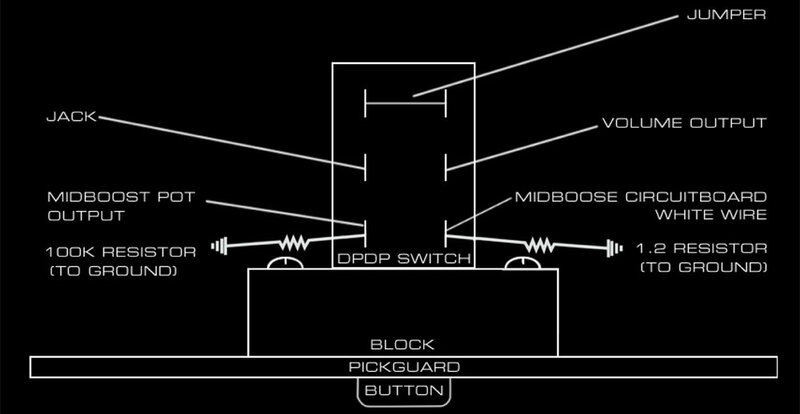 The white wire attached to the upper lugs of the switch stays on the switch and is removed from the right side of the midboost pot. Cut the wire attached to the upper lugs of the switch, leaving the end soldered in place across the lugs as a jumper. Solder a 100k ohm resistor to the lower left lug of the switch and a 1.2 ohm resistor to the bottom right lug of the switch. The resistor wire or solder cannot touch any other metal on the switch. 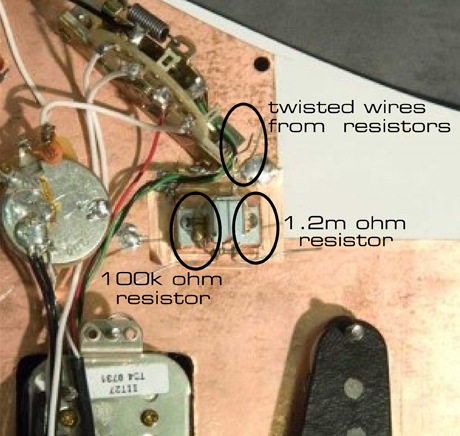 Locate the resistors against the sides of the switch as shown and twist the wires together behind the switch. Solder and time the wires leaving about 1/8” (2 mm) of wire. Cut off the excess wire that is twisted together behind the switch and solder a short piece of wire to the twisted ends of the resistors. Solder the other end of the wire to the back of the volume pot. Solder the wire from the midboost pot to the lower left lug (with the 100k ohm resistor) of the switch. Run a new wire from the center lug of the volume pot to the right center lug of the switch. Re-solder the black ground wires to the back of the volume pot. Re-solder the purple and blue wires to the midboost pot. Solder the midboost input to the lower right lug of the switch (with the 1.2 ohm resistor). This is the white wire that connects to the midboost circuit board. Solder the wire from the jack to the left center lug of the switch. Reinstall the pickguard. Check to make sure no wires are caught between the pickguard and guitar body. 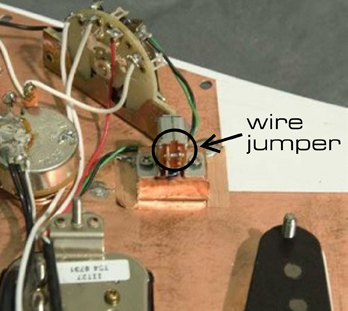 Test guitar by plugging it into an amp at low volume and tapping lightly on the pole of one of the pickups with a small screwdriver. When the button is down the midboost is bypassed and the midboost now will have no effect. When the button is up there will be a small volume increase and the midboost will now work as before. Reinstall bridge and springs, then restring.